Every quilter has piles of scraps; however, I tend to have more than most. Fabric for the challenge quilts my sisters and I make after our quilt trips must be purchased on the trip. (It is our own crazy requirement.) I always seem to purchase too much fabric. I rationalize this way: since I am a reluctant quilter, I am afraid that by the time I work on the quilt that the fabric I selected will no longer be available. I can usually make two quilts from the fabric that I purchase. 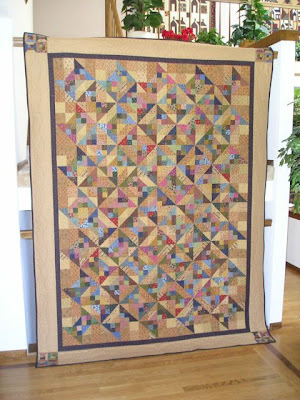 Scrap quilts have always appealed to me, and nearly all of my quilts are scrappy. They reinforce the concept making something from nothing and of "making do." Scraps from Duluth Stars were used to make Scrappy Spools, although, I do admit to "borrowing" some fabric from Marilyn's stash to make this a larger quilt. 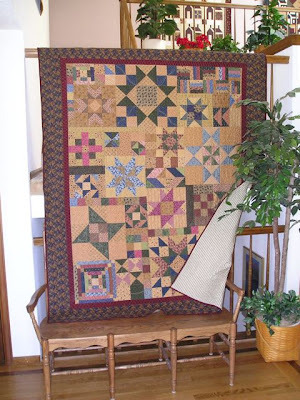 The quilt measures 74 X 99 inches and was machine-quilted by Candy Carpenter, The Comfort Zone, in Riverton, WY. I found the idea for this quilt here. 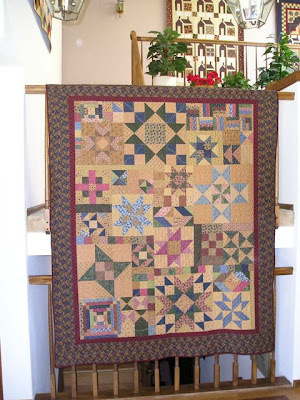 Duluth Stars was started in June 2005 and finished in June 2008, which is not bad for a reluctant quilter. My two sisters (Marilyn and Evelyn) love to quilt, but I only dabble in the craft; however, I like to accompany my sisters on trips to quilt shows. In 2005, we took a road trip to Duluth, MN to attend the Stars in the Harbor show. On the way to Duluth, we decided to make a challenge quilt and picked the Wyoming Valley block. We determined that each of our quilts had to use this block as well as a variation of the block. The Wyoming Valley block is the large block on the bottom, and the variation, using brown fabrics is in the top left. All of the quilts I have made are more conventional with rows of blocks all the same size, so I decided to shake things up by using a variety of block sizes and patterns. The blocks were easy to make, but sewing them together to form a quilt was more difficult than I anticipated. Marilyn offered to help me piece the quilt top together, and it was a challenge. It was like putting a jigsaw puzzle together. Candy Carpenter from Comfort Zone, Riverton, WY did the machine quilting for me, and I am very pleased with her work. The quilt measures 68 X 84 inches. I used a Moda fabric on the back that resembles pillow ticking, and it complements the top nicely. These photos were taken at Marilyn's house this past week. You can see some of her work displayed on the wall at the top of the stairs. She has made some really awesome quilts. 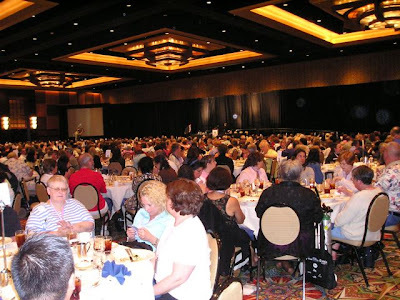 Take one ballroom, add over 1,000 people, a fabulous hotel and staff, and some informative sessions, and you have a weekend of fun and education. I was fortunate to be awarded a scholarship to attend the 8th International Pulmonary Hypertension (PH) Association Conference. 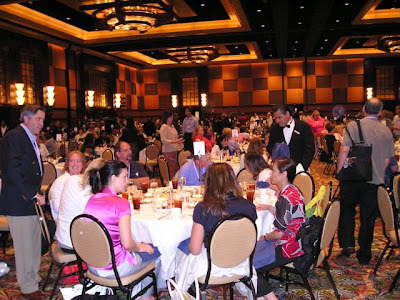 The conferences are held every two years and include not only PH patients but also physicians and representatives from numerous pharmaceutical companies. Scientific sessions (for medical personnel) were held on Thursday. Patient-led sessions on Friday covered numerous topics for the PH patient. On Saturday and Sunday, physicians and nurses hosted sessions for patients and their care-givers. I took copious notes so I can use the information in the newsletter that I prepare for the Wyoming Pulmonary Hypertension Support Group. 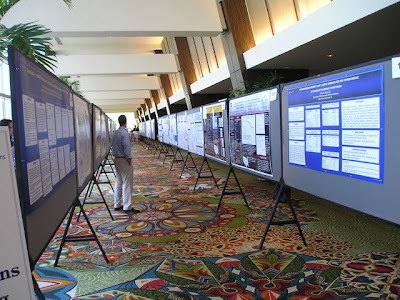 Posters that explained current research projects were on display and many of the researchers were available to answer questions. Much of the information was beyond my understanding, but the work that these individuals do take us one step closer to a cure for this devastating disease. By looking at these scenes from my hotel window, does anyone know where the conference was held? 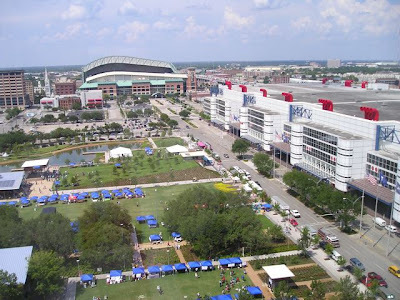 Perhaps the baseball stadium in the background will provide a clue to the location. Its roof has lost a lot of its original luster, the antlers have been broken off of the stag mounted at its peak, and the characters on the revolving bar have been glued back into place several times. Despite its condition, I consider this barometer one of my most valuable possessions. It may be very old and looks somewhat ratty, but it still predicts the weather without fail. 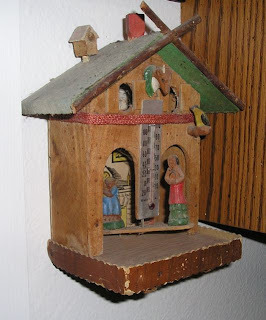 During my childhood, the farmhouse porch was the home for this simple hut-shaped barometer, and everyone in the family knew what my mother meant when she stated, "The old witch is out today, so be careful" or "It is going to be nice today, the kids are out playing." 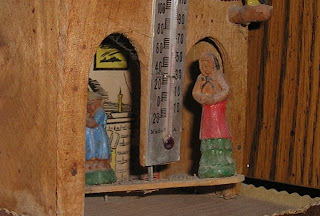 This spring, the casual observer might think the barometer is broken because the witch has been out nearly every day since the first of June. She remains out today: it is cold and windy even though the sun is shining. According to the newspaper, today's predicted temperatures were a high of 49 degrees Fahrenheit and a low of 40 degrees; that's cold for the 11th of June. The radio announced this morning that the upper, ski run at Jackson Hole will be reopened this weekend due to new snowfall. My mother's words continue to echo through the chilly air, "The old witch is out today, so be careful!" Earlier this week, I finished one of the Mineshaft socks mentioned in the June Pillow Talk, so half of my goal has been met. I put the Mineshaft socks on hold when I began knitting the Ships Project Slipper Sox. Now that I have finished three pair of the Slipper Sox, I can focus on the final Mineshaft and should easily have a complete pair by the end of June. 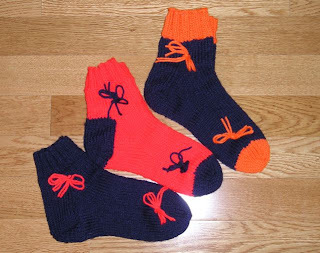 The socks are finished and off the needles with time to spare. Perhaps your grandmother did some knitting for the Red Cross. 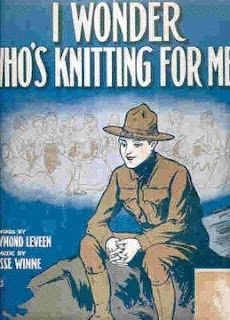 Perhaps, your great-aunt knit for the troops while she worried about the safety of her nephew or even a beau. Now you, too, can help bring a lonely young man or woman some "comfort from home." This is a challenge for all those who read this blog. 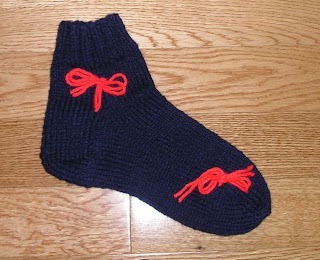 Will you please consider making at least one pair of these slipper sox for the troops? Want to see the impact these items have on the troops? Read these letters and look at these photos. This month, the Ships Project is sending this shipment. Please consider making something even though you may not make this deadline because the packages are sent each month. Just don't have time to make anything but still want to help? Donations for postage are always welcome: see the Ships Project home page for information. Please consider spending some crafting time this weekend to provide a little comfort from home to the troops who are representing our country around the world on land and at sea. Isn't their sacrifice worth your time? 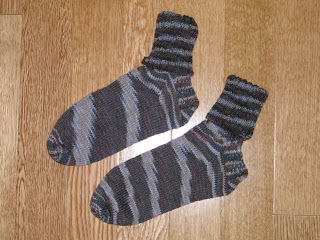 Tonight, I grafted the toe on the third pair of slipper sox. Hopefully, I will be able to make some more before the end of June. Even though summer is officially over a month away, I have always equated June with the beginning of summer. For 33 years, June signified the end of school and two and a half months of freedom from grading essays, planning lessons, and dealing with teenage attitudes. Last weekend, I bought a watermelon because it sounded so good, and I was bitterly disappointed because it had no taste at all. I guess even watermelons know that it is not yet summer. I have several knitting projects planned for June. The Oddball Knitting group has decided to take some time off this summer, so we are not starting any new blankets. The ones rotating now will be the last until August. I still have two blankets scheduled to arrive in June: Pastel Rainbow and Neon Rainbow. I am trying to destash, so I am also working on another Oddball Baby Blanket on my own, using some Caron Dazzleaire in Baby Yellow/Green. I currently have about two inches done. I am trying to bring some organization to my life and to my guest bedroom. I have so many projects going that I simply cannot move, let alone work, in there. I boxed up six pounds of vintage, baby yarn that had been given to me two summers ago and sent it to a lady in Pennsylvania who is going to use it to make burial gowns and other items for charity. The removal of this yarn hasn't made much of a difference, so I need to see what other changes need to be made. A major goal for June is to finish the socks that I started over two months ago. The yarn (Lornas Laces Shepherd Sock "Mineshaft") is a bit drab (my choice for everyday socks), but it just does nothing to motivate me to finish the socks. 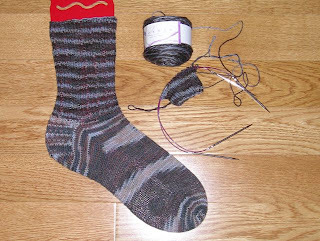 I am determined that the socks will be completed by the end of June. I am on the gusset of the first sock, so I hope to report more progress by the end of the week. 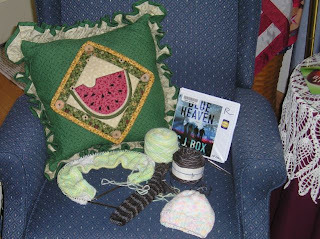 I love to listen to audio books while I knit. Last week, I picked up Blue Heaven by C.J. Box. I will spend this afternoon immersed in this book while knitting on the Mineshaft sock. The coordinators for the Yahoo group, All Crafts for Charity, have approved my proposal for baby hats and blankets. The group will sponsor a two-week drive for the hats and blankets for my local hospital. I am hoping that the group will be able to provide enough items to supply the nursery for the remainder of the year. 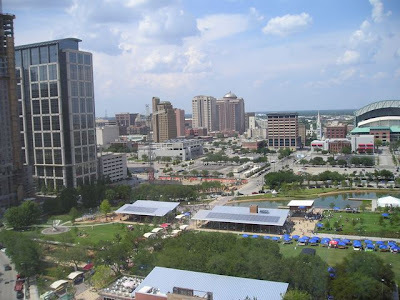 The local ladies who were helping me have moved or lost interest; however, I cannot not see dropping the program because it fills such a need in our community, so I have been plodding along on my own. Some of the sparkle has gone out of my enthusiasm, so I am hoping the AC4C group can help build a stash of items so I can catch my breath a bit. June is my portal for change - a change is seasons, a change in attitude, and a change in direction.